The Church of the Nativity in Bethlehem is becoming the church of contention, with a bid by the Palestinians to use their position as the newest members of the U.N.'s cultural arm to obtain World Heritage status for the iconic Christian site — and perhaps boost their own campaign for legitimacy. The Church of the Nativity in Bethlehem is becoming the church of contention, with a bid by the Palestinians to use their position as the newest members of the U.N.’s cultural arm to obtain World Heritage status for the iconic Christian site — and perhaps boost their own campaign for legitimacy. The effort by the Palestinian Authority, like its overall efforts for global recognition for an independent Palestinian state, is drawing resistance. And it may fail at the World Heritage Committee meeting that starts Sunday. An experts committee has turned down the emergency bid to quickly confer on the Church of the Nativity, and its pilgrimage route, the status as an endangered World Heritage site, saying the application needs more work. Even custodians of the holy site, the Greek Orthodox, Roman Catholic and Armenian churches are opposed, according to a document obtained by The Associated Press. The church — which drew some 2 million visitors last year and parts of which are 1,500 years old — stands above the grotto that Christians believe was the birthplace of Jesus. The Palestinians’ application asks for recognition as a site of “outstanding universal value” urgently in need of attention. There is concern by the United States and others that the Bethlehem holy site and the integrity of the World Heritage process risk falling victim to the politics that for decades have torn the region asunder, with the Palestinians using their foothold in the U.N. system to grab symbolic recognition of their elusive bid for statehood in a long-disputed land. The World Heritage candidacy of the Church of the Nativity and the pilgrimage route is one way for the Palestinians to prove they are responsible stewards of the site which draws tourists the world over. Above all, it is part of a broader attempt by Palestinian President Mahmoud Abbas to seek international recognition for a state of Palestine after its controversial backdoor entry into the U.N. system. Negotiations with Israel on the terms of a Palestinian state have been frozen since 2008, mainly because Abbas and Israel’s hardline prime minister, Benjamin Netanyahu, have failed to reach enough common ground for meaningful talks. Meantime, Abbas has tried to create new leverage, including with a quest for U.N. membership for a state of Palestine in the West Bank, Gaza and east Jerusalem, the territories Israel occupied in 1967. The U.N. bid has been stalled for months, but Abbas hopes to garner recognition for Palestine wherever possible, including with a nod from UNESCO for Bethlehem. Angry at Palestinian membership in UNESCO, the United States pulled its $80 million in annual dues — 22 percent of the overall budget — from the Paris-based organization after the October vote that made the Palestinians the 195th member. Bucking the bad feedback, the Palestinians refused to follow UNESCO custom and withdraw the candidacy — as the French did with their emergency bid for the Chauvet cave, with its hundreds of prehistoric drawings, when it got a negative recommendation from the experts. The Palestinians now risk losing face at the World Heritage Committee meeting from Sunday until July 6 in Saint Petersburg, Russia, when 33 sites from around the world will be considered for the coveted World Heritage status. A surprise thumbs up could feed rancor and rivalries in a volatile region, within the church itself and perhaps at the U.N. Educational, Scientific and Cultural Organization. Already, the Palestinian ambassador to UNESCO, Elias Sanbar, has denounced a “persistent campaign of rumors” at the organization. Protecting the cultures of the world is among UNESCO’s core missions and there is little doubt the Church of the Nativity — with a longstanding problem of leaks from the roof — is in need of repair. A program administered by the Palestinians is already in progress. Located in the Israeli-controlled West Bank, it is managed by three churches, each jealous of its role as custodian of the site, defined under an agreement dating back to the Ottoman Empire. With a big measure of diplomacy, the leaders of the Greek Orthodox, Catholic and Armenian churches rebuffed the Palestinian proposal, politely reserving judgment on its reasons. “In our opinion, we do not think it opportune to deal with this request that the Basilica and its entire complex be included in the list of World Heritage sites, due to different considerations,” read a letter to Palestinian Authority Mahmoud Abbas signed by the three leaders. A copy of the letter was obtained by The Associated Press. Among other things, a World Heritage designation raises fears that the delicate arrangement of custodianship might be disturbed. Fights among priests using broomsticks have been known to break out in the past over a perception that boundaries are being overstepped. “A church is a church, it shouldn’t become a world heritage. It’s a sacred place and its ownership is not for anyone,” Daher said. The Palestinian emergency application cites lack of regular restoration on the church due to the political situation since 1967 when Israel occupied the territories and difficulties procuring equipment because of lack of free movement imposed by Israeli forces. Though Israel captured the West Bank, it turned much of Bethlehem over to the Palestinian Authority in the 1990s. The U.S. State Department did not hide its disapproval of the Palestinians’ emergency bid. “We are disappointed by the Palestinians’ intention to push through an emergency inscription against the recommendation of UNESCO’s own experts and without thoroughly consulting all stakeholders,” a statement said. It made clear that Washington’s objection stems from the rush job that an emergency candidacy implies and which prevents a full review including by those with a stake in the outcome. It suggests the application be resubmitted under normal procedures with fuller detail. That takes about 18 months, meaning it could be re-nominated in 2014. “Palestinians are continuing with their bid, and they are still hopeful and optimistic that they will succeed,” said Palestinian government spokesman Ghassan Khatib. He declined to elaborate. The Palestinian delegation to UNESCO refused any comment until after the Saint Petersburg meeting. However, a letter circulating among delegations suggested a plot was afoot. The June 11 letter, a copy of which was obtained by The Associated Press, included what is purported to be a statement of support for Palestinian leader Abbas signed in type by the Roman Catholic and Greek Orthodox leaders, noting the Armenian was absent. The official asked not to be identified because of the sensitivity surrounding the Palestinian bid. 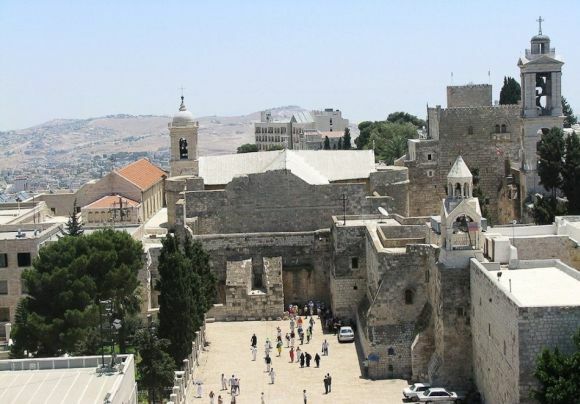 Despite fears by some that Palestinian backers on the committee will win the church the emergency designation as an endangered World Heritage site, others say it would be highly unusual for the voting committee to ignore the experts’ negative recommendation. “The committee is a sovereign body. Experts are there to give expert advice that is usually taken on board,” said UNESCO spokeswoman Sue Williams. Win or lose, the Palestinians are looking to putting their mark on other sites under their purview, including historic Bethlehem. That gets a green light from the custodial churches at the Nativity — as long as the church itself stays off limits. Dalia Nammari in Jerusalem and Karin Laub in Ramallah, West Bank contributed to this report.